Google Ads is a form of search advertising, and if it didn’t catch your attention during your initial research, maybe it should have. That’s because millions of consumers use Google to look for products every day. Your business should be in front of them. You also may have noticed that these ads are always changing based on what you have searched for. That’s because these ads are based on keywords that are selected by and specific to the businesses that bid on them, making them highly relevant to the audience that ends up viewing them. The position of these ads is not randomly selected, but based on an auction. Each business bids on the most relevant keywords, and the higher bid and better fit for that keyword wins the higher spot. Even if other businesses bid more than you, your ad can still end up in a higher position, at a lower price, if you use highly relevant keywords. As a small business, you may have a physical store that people need to visit in order for you to serve them. With Google Ads, you can target your ad to appear to people based within a specific geographic range. By advertising to people in your geographic location, and not in others, you are making sure your ads are reaching only the most relevant potential customers. 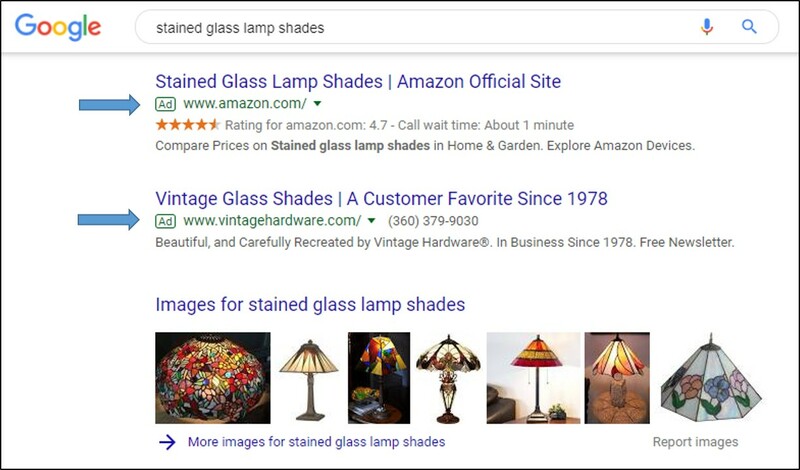 To create the most effective Google search ads, you need to know what your customers are searching for — and no one knows their customers better than small businesses. When you set up your ad, you need to bid on the best keywords that not only relate to your business but also address the problems your customers are having that your business solves for. You have to think like your customers to find the right keywords. Knowing the right balance of keywords will win you the higher spot, and target your ads even further to appear in front of the exact people that need a business like yours at that moment in time. Another benefit that comes with using Google Ads is that you set the timeline for them to run. This can be a necessity if you are the only one running your business or marketing initiatives. Taking a vacation? You can turn these ads on and off whenever you need. Seasonal business? Set your ads to end a month before your business closes. Google Ads uses a type of ads also known as “pay-per-click” or “PPC ads”. This means that you only pay for the ad when someone clicks on it. If you are unsure what your advertising budget will look like far in advance, don’t worry. How much you spend is entirely up to you. With Google Ads, you can set your budget ahead of time, capping it at a specific price. This way, you will never spend more than what you can set aside. Google kept small businesses in mind when creating Google Ads. They even built “Smart campaigns” by tailoring the technology available with Google Ads for small business owners. With Smart campaigns, you can create effective ads in minutes that deliver results — like consumers calling your business, visiting your website, or coming into your store. Check out how other small businesses are using Google Ads. To start using Google Ads, just create an AdWords account. This site will walk you through identifying your goals, creating your ad, setting up targeting and spending specifications, and sending your leads to the right place. In terms of maintenance, it’s a “set it and forget it” approach. Your ads will run until the time you indicate, or your budget is hit. Then you can review how they performed in your AdWords account and start planning your next ad. The fact is, as a small business, the easier it is to launch a certain marketing initiative, the more likely you’ll be able to do it successfully. With many businesses having just a single person running them entirely, you have to pick and choose where your focus goes and predict if the effort will be worth the results. Google Ads provides the wiggle room and flexibility small businesses require with little commitment and big return. Don’t want to commit to spending at this time? Check out how you can get your business to appear on Google for free by using SEO.